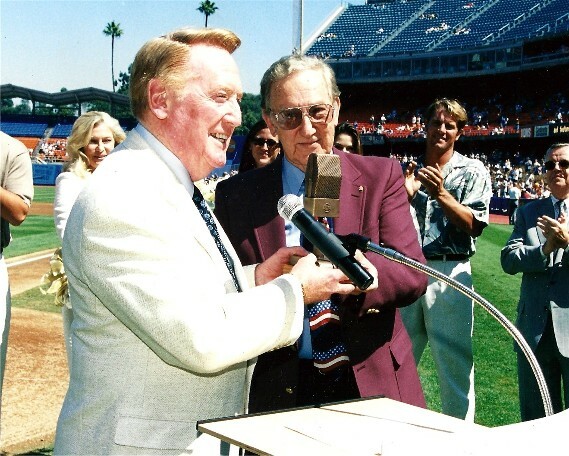 August 29, 2012 - "The new ownership of the Los Angles Dodgers have hit a home run in the their decision to retain the legendary sportscaster Vin Scully as their play-by-play broadcaster for 2013, and Scully’s agreeing to do so,” stated Lou Schwartz, President of the ASA. Scully, who was named “Sportscaster of the Century” by the membership of the ASA in 2000, will begin his 64th season with the Dodgers. He is the longest-tenured broadcaster doing sports, having started with the Brooklyn Dodgers in 1950. He will, as usual, do all the home games, as well as the road games in Arizona and California.